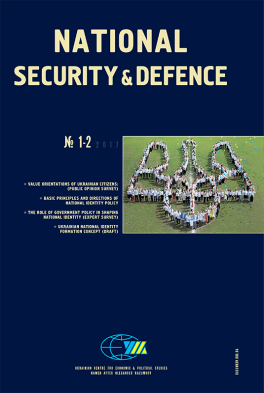 The National Security and Defence Journal “Basic Principles and Means of the Formation of a Common Identity of Ukrainian Citizens” (issue 1-2, 2017) came out in print, prepared in the frame of the project “Building a Common Identity of Ukrainian Citizens in the New Environment: Special Aspects, Prospects and Challenges”, implemented by the Razumkov Centre together with Matra European Partnership Programme and Konrad Adenauer Foundation Office in Ukraine. The journal contains analytical materials based on results of sociological and expert survey, which characterise socio-psychological climate in ukrainian society as a factor in forming the value system, ethnic and language identity, identity as identification with a certain community, ethnic stereotypes, value orientations of ukrainian citizens, social and political values. The journal also presents expert interviews, opinions of participants of Roundtable discussion “Basic Principles and Means of a Common Ukrainian Identity Formation” (Kyiv, 12 April 2017) and the Conceptual Approach to the Formation of a Common National Identity of Ukrainian Citizens. We hope that this study is useful for everyone interested in the process of building the common national identity of Ukrainian society, Ukrainian political nation. Find the full journal here.